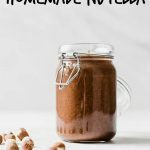 This delicious and addicting two-ingredient Nutella is perfectly spreadable and ready in about 6 minutes! It’s a must-make. Place hazelnuts into a high power blender or food processor and pulse for a total of approximately 4-5 minutes, stopping every 30 seconds or so to scrape down the sides. Once hazelnuts have formed hazelnut butter, pour into a bowl and stir in chocolate. Hazelnut butter should be warm from being blended for so long, so the chocolate should melt with consistent stirring. If chocolate does NOT melt, place mixture in a saucepan over the stove and stir until melted. Place Nutella in a jar and enjoy! **I use dry roasted unsalted hazelnuts and they blend fine without being roasted in the oven. However, if you buy raw hazelnuts you will need to roast them in the oven at 400° for approximately 10 minutes before you place them in your blender/food processor.